When the Vancouver Canucks selected Jake Virtanen sixth overall in the 2014 NHL Entry Draft, they had high hopes for the local, New Westminster product, to say the least. However, ‘JV’ has been subjected to a healthy amount of criticism through his first 140 games with an Orca on his chest — he’s only amassed 34 points. With that being said, the young man has fought through the Vancouver media shade and is trending in the right direction. He is poised to have a breakout season in the coming 2018-19 season and realize his true potential and exploit his strengths on the ice. At 21 years of age, Virtanen has yet to fully develop but as such a high draft pick, people expected more of an offensive role from him. Instead, he seemed to play best in a bottom-six capacity. In the 2017-18 season, Virtanen had some looks with Daniel and Henrik Sedin and seemed to play quite nicely with them but ultimately, he wasn’t productive and was moved off of the line. Finishing with 10 goals and an identical amount of assists in 75 games as last season, it was a step forward but it wasn’t a leap or even a bound and heavy criticism continued. Perhaps the shade stemmed from comparisons to his fellow draft mates, players like William Nylander (Toronto Maple Leafs), David Pastrnak (Boston Bruins) and Nikolaj Ehlers (Winnipeg Jets) who have all been successful with their teams and were drafted after Virtanen. The comparisons are not fair. Plain and simple. All three of those players are on playoff teams and playing with serious talent like Auston Matthews, Brad Marchand and Patrik Laine. Virtanen had that short stint with the Sedins, but beyond that, he hasn’t seen any considerable action with notable stars. 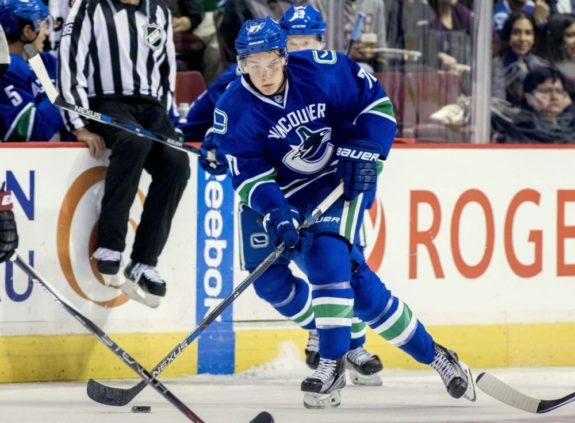 The 2018-19 campaign is going to be a huge season for Virtanen and he’ll chalk up at least 20 goals while being a threat in all areas of the ice with his physicality and speed. Why am I so confident? In the back-nine of last season, Virtanen was flying and finally realized just how fast he is. His speed will be the key to his future success. Virtanen is the fastest guy on the Canucks and one of the fastest in the NHL. I would not be surprised to see him in next season’s or the season following’s All-Star game and competing in the fastest skater contest. Hot take, I know. Late this season, Virtanen was carrying the puck up ice with authority and burning defenders wide almost every time, but he didn’t create too many dangerous scoring chances. As his confidence continues to increase, he should start driving to the net hard and putting the puck into more high-percentage areas. His speed is hard to contain and in tandem with his decent size, he can be an elite power forward. This offseason will be crucial for his future. Virtanen’s skating is already where it needs to be, but he needs to focus on goal scoring, an ability that is buried in there somewhere as we’ve seen it come out during his time with the Calgary Hitmen. A once 45-goal scorer in the WHL, he’s got the talent to be an offensive threat in the big leagues. 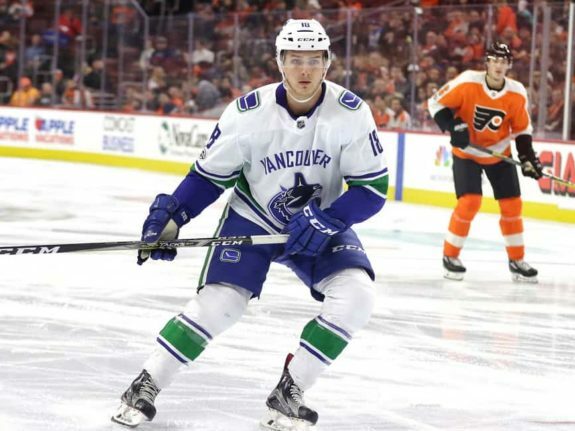 The Canucks, as a whole, are getting younger and a lot faster, so Virtanen will be playing with some like-minded talent and hopefully be able to generate some chemistry with somebody like Adam Gaudette or even Jonathan Dahlen if he makes the team, next season. Virtanen is built for playoff hockey and the Canucks just need to get there. Don’t sleep on this kid, he’s ready to explode.